CARBONDALE, ILL. - In 2014, when Southern Illinois University Carbondale began preparing for the August 21, 2017, total solar eclipse, there was no blueprint to guide its planning. Four years later, the university’s eclipse events have been recognized with a grand gold award from the Council for Advancement and Support of Education. CASE is an international association of 3,700 colleges, universities and independent schools. Bob Baer, co-chair of an eclipse steering committee made up of university and community representatives, said the committee didn’t know what to expect when it started planning. Scott Ishman, Baer’s co-chair and the current interim dean of the university’s College of Science, said it eventually became clear that SIU and Carbondale would be a focal point for visitors and members of the scientific community on eclipse day – which also happened to be the first day of classes. 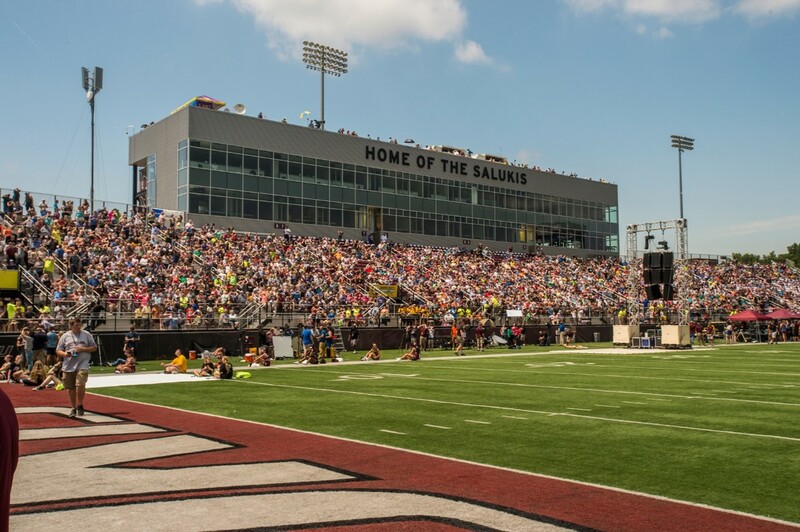 Among the events that took place on campus over several days were a science and technology expo, a comic con, a live broadcast of Planetary Radio airing on PBS stations, and a range of activities at Saluki Stadium, highlighted by the eclipse itself. That effort was recognized last week with a CASE grand gold award for multi-day special events. CASE’s annual “Circle of Excellence” awards program honors outstanding work in advancement services, alumni relations, communications, fundraising and marketing at educational institutions. Winners are selected based on overall quality, innovation, use of resources and the impact on the institution or its external and internal communities. This year, CASE received more than 3,200 entries in nearly 100 awards categories. Judges – who who are peers from CASE-member institutions – may award bronze, silver and gold awards and have the option of honoring exceptional entries with grand gold awards. SIU was one of 13 institutions earning a grand gold this year. Other institutions winning awards in the special events categories this year include Auburn, Carnegie Mellon, Clemson and Duke universities, the University of Miami and the University of Southern California. Another Illinois institution, MacMurray College in Jacksonville, was also recognized. SIU Chancellor Carlo Montemagno, who was in his first week on campus when the eclipse took place, said he was impressed by the teamwork he witnessed. SIU and Carbondale are also on the path for a total solar eclipse April 8, 2024, earning the area the title of “Eclipse Crossroads of America” and providing a unique opportunity to observe and study both eclipses from the same location. SIU Carbondale earned a grand gold award from the Council for Advancement and Support of Education for its work involving the Aug. 21, 2017, total solar eclipse that brought more than 30,000 people to campus, including more than 250 journalists from around the world. SIU was one of only 13 institutions to earn a grand gold award this year.